Can Universal Basic Income through Cryptocurrency Save Our Economic Future? Universal Basic Income, the notion that every person should be guaranteed a regular income regardless of whether they are working for it or not, is captivating to some and repulsive to others. Its supporters argue that having an unrestricted source of regular income for all will help mitigate the coming mass extinction of jobs due to automation and artificial intelligence, further stimulate the economy, and encourage entrepreneurism. UBI’s detractors believe that it would incentivize laziness and bolster the welfare state. Regardless of the arguments for and against UBI, it all comes down to the almighty dollar. Who will pay for a no-strings-attached income to anyone that wants it? Some estimates put the annual price tag for a guaranteed monthly payment of $1,000 to every American at $3.8 Trillion. That’s nearly 4 times the current amount spent on government welfare programs each year. As a result the estimated UBI price tag is a showstopper for Democrats and Republicans alike. But there is a promising new vehicle to fund UBI that would potentially cost the government very little or nothing at all: cryptocurrency. This does not equate to subsidized bitcoin payments to the public, but to the private distribution of UBI-specific cryptocurrencies to anyone who wants them at a set amount over a specified period (for free). As with current cryptocurrency selling, holders could trade their UBI tokens for real dollars or hold them as assets for possible future gains. Some UBI-based cryptocurrency experiments are already in play, through projects like SwiftDemand, Mannabase, Circles, and Solidar. While all of these initiatives are in the early stages, interest is indeed growing. Mannabase, for example, already boasts 175,000 verified users and is growing by 500 new users a day. (Full disclosure: I am an unpaid advisor to Mannabase). Tokenized UBI also has the advantage of transferability from one individual to another. More affluent holders of UBI cryptocurrencies could easily offer them to the less well off locally or abroad. The UBI tokens could also be used to support institutional sustainability and growth, such as through the distribution of UBI tokens to charities and small businesses. Crypto-UBI could also help create a new, self-sustaining economy through the use of UBI tokens for the purchase of goods and services. SwiftDemand already operates an early stage online marketplace, enabling “Swift” token holders to exchange their free tokens for everything from coffee to social media services to nonprofit donations. In theory the use of UBI cryptocurrency could actually save the government money, by substituting a portion of government welfare payments with independent cryptocurrency payments. This could mean significant savings for safety net programs, which cost the Federal government $366 billion dollars in 2016 alone, not including Medicaid and Medicare. But replacing government payments with cryptocurrency subsidies has potential disadvantages too. As we know from the recent wild bitcoin ride in cryptocurrency markets, volatility is a major challenge. For someone on a fixed income relying on a monthly subsidy, a sudden cryptocurrency market correction and a resulting loss of value of their UBI tokens could be devastating. Of course an increase in value of the cryptocurrency could do the opposite by making one’s regular subsidy worth even more. The cryptocurrency volatility issue could be addressed in two ways. First, by using “stable coins” for UBI payments. Stable coins are cryptocurrencies pegged to the U.S. dollar or other fiat currencies, which can be used as an alternative to more volatile currencies like bitcoin. A second solution might be regular and increasing government purchases of a UBI cryptocurrency at a fixed rate, which could potentially have the effect of stabilizing or even driving up UBI token value. 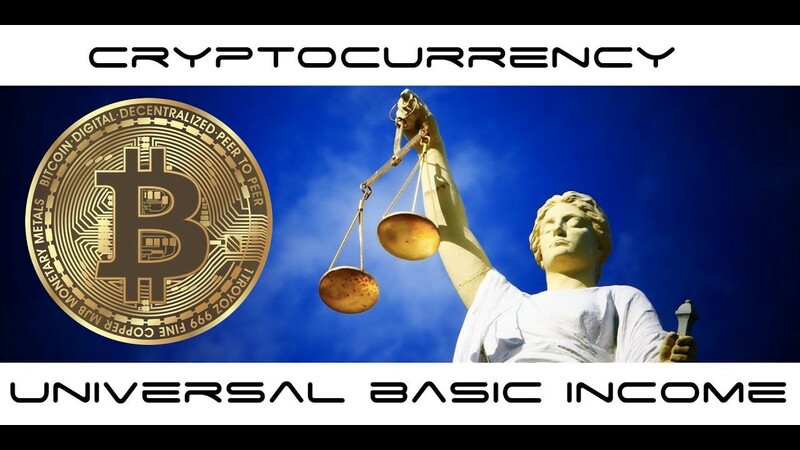 As the value of the UBI cryptocurrency increased, government welfare subsidies through direct payments could be reduced proportionately, creating a win-win for the government and UBI cryptocurrency holders. While cryptocurrency-based UBI is still young and unproven, if nothing else it motivates us to think more creatively about how to address economic security in the shadow an uncertain future. By thinking outside of the current financial box, we may be able put our economic fate back into our own hands — job wrecking robots or not. Paul is a nonprofit management consultant, social entrepreneur, and writer.